Keep your Vector® lighter clean from any type of dust (i.e., falling ashes when cigars and cigarettes are lighted, and dust from pockets when lighters are kept in your pockets). Use lighter leather pouches to prevent dust from penetrating into the lighter. Over 90% of return lighters are serviced simply by blowing off excessive dirt and dust inside a lighter using compressed air. If necessary, blow off any excessive dirt and dust from the catalyzer area using a compressed air can. Compressed air cans may easily be purchased from any local hardware or office supply store. Jet Turbo Flameless, Jet Torch, Jet Laser, and Electronic Piezo are not ordinary fluid flint lighters. They all have sensitive ignition mechanisms that require delicate handling of the ignition switch. Do not flick or press ignition switches like a fluid flint lighter at a fast pace. There are two different types of ignition switches; push-down and slide-down ignition switches. For both ignition switches, operate them slowly and gently. The lighter ignition system has a split-second delayed reaction time. Fast ignition usually results in misfiring, whereas slow and gentle ignition method ensures perfect ignition every time. 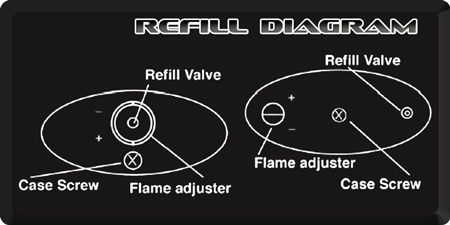 When the flame gets weak and low, it usually means a time to refill. Constant ignition and adjustment of the flame height when the flame is weak can seriously damage lighters. Use Vector Butane to refill the lighter. Click on links provided below to view more information about your Vector® product. How do I refill my lighter? How do I receive service/repairs on lighter(s) under warranty? What type of lighter do I own?